The sun is shining, the wind is blowing, and there’s a turtle swimming around the bay keeping us entertained. What more could we want? Maybe an engine that ran!? When we last reported, the engine-fix-it-guy was on his way to our rescue while we were docked in Marina de La Paz. We finally made it onto his busy schedule on Thursday, and after putting all the pieces back in place and tweaking this and that, voila, we had an engine! The alternator was charging the batteries, there were no leaks to be seen, the valves were doing their valve thing and the injectors were injecting; all was good! The problems with the engine were chalked up to an air leak that was causing the engine to shut down. The hose and hose clamps that were the culprits were fixed and the alternator mysteriously fixed itself. Who knows…at any rate we said goodbye to Mr. Fix-it and planned for an early departure from the dock. In the morning we did all our last minute chores, removed all the garbage from the boat, made sure everything was stowed in preparation for the expected lumpy sea, completed our pre-departure engine and instrument checks, updated the log book, shared a traditional PDH (Pre-Departure Hug); then it was time to cast off the lines! We motored out of the marina, and made our way out the channel, coasting along on the outgoing tide. Ahhhh, it felt great to be underway. We needed to refuel so we pulled into the fuel dock at Marina Palmira. We also needed to pay for the engine work, so Marty walked over to the Cross Marine office to get all that taken care of. All fueled, all paid, and ready to go, but Happy Dance had other plans. The engine didn’t want to start! We chalked it up to possibly being too hot, so we ran the fan a bit longer until the engine temp was lower. It took a number of tries, but eventually we got it started. In hindsight we should have gone back to Cross Marine then and there, but you know what they say about hindsight. We motored out of the channel and headed north toward the islands. Our plan was to anchor somewhere up on Isla Espiritu Santos where we’d be out of the NE winds that were forecast to be in the high teens, low twenties. Along the way we got a call on the VHF from our friends on Cake who had decided that bashing into the waves for three hours wasn’t going to be all that fun so they were anchored in Bahia Falsa, just a few miles up the way. We figured that sounded like a good choice and joined them for a lovely calm night after a blustery day. 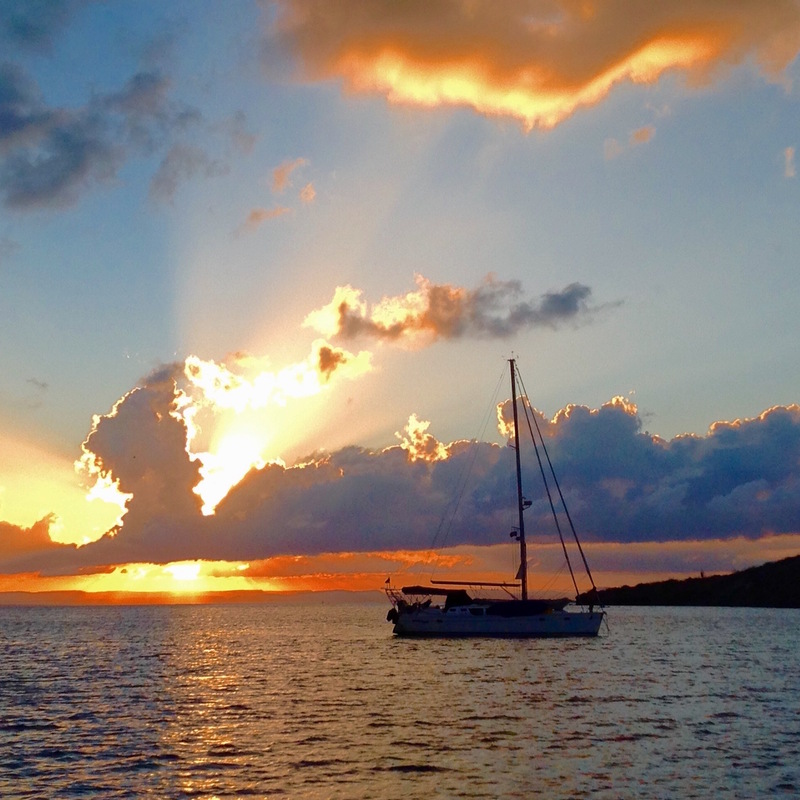 Happy Dance enjoying the sunset in Bahia Falsa…photo credit to s/v Cake! The next morning we were up at dawn and watched as Cake weighed anchor to head north before the NE winds kicked up again. We had a second cup of coffee and listened to the morning weather reports before starting the engine and weighing anchor around 8:15am. Once out of the bay the wind was already in the high-teens with some steep choppy waves so we rolled out the mainsail and staysail, and set our course as close to the wind as possible since we’d have to do two sides of the triangle to get to where we were going! Then it was time to turn off the iron genny. Ahh, silence. As we got further offshore, the wind picked up and we were doing 6 to 7 knots while beating to windward in a lively sea. It was a great sail and Happy Dance was perfectly balanced with the staysail and the main out, so we were able to point at about 40 degrees off the wind with zero weather helm. Lovely! A great day for a sail! Then we crossed into the lee of the island and it was like someone turned off the fan. The wind immediately fell to about 9 knots from the 18-20 we’d been enjoying. 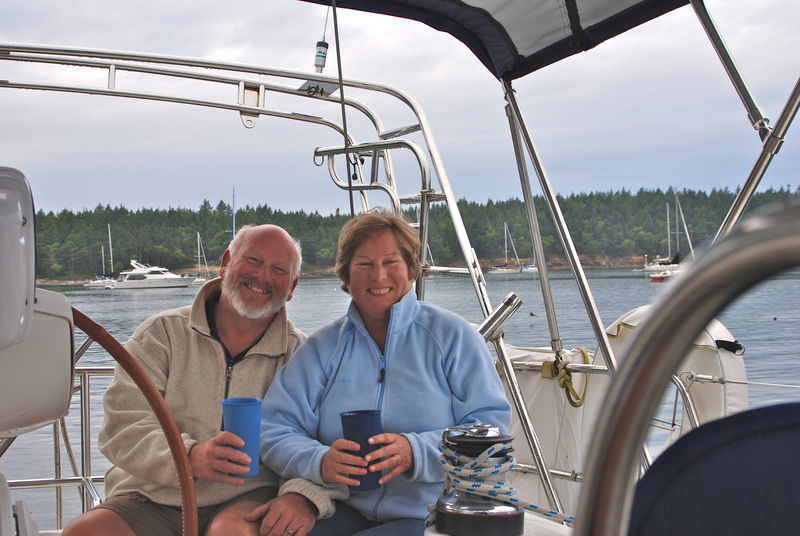 We rolled up the staysail and rolled out our big 135 Genoa. Even with more sail out our speed fell to about 3-4 knots in a rough sea. We kept tweaking the sails to keep moving along as best we could but without a strong wind, the waves kept pushing us back, so we decided to start the engine and motor sail for a bit. At least that was the plan! As you may have guessed, we couldn’t start the engine. After a few tries, Marty went below to see what he could see. He bled the fuel lines thinking it might be a fuel problem, but there was plenty of fuel at the engine. There didn’t appear to be any air in the system either. Everything looked to be working fine, with the one exception that it wouldn’t start! We can’t pull off the freeway and call the two truck, so now what. We’re about 6 miles offshore heading to an anchorage that may or may not be an easy entrance depending on how deep the wind is blowing into the bay. If it’s not blowing over the mountain into the bay we won’t be able to sail in deep enough to be in shallow water and out of the swell. Plus if we can’t get the engine going again, we’re stuck on an uninhabited island! Next choice was to return to La Paz, but the thought of sailing up the 4.5-mile narrow, dredged, buoyed channel against the current without an engine made us cringe. It wasn’t a very nice scenario to think of the sand bars and shoals on the edges of the channel that would limit our maneuverability. Our next option was to head back to Bahia Falsa where we had been overnight. There was plenty of room to anchor there and if the wind held out of the NE we could possibly sail right in. Plus, we would have cell phone coverage and could call Cross Marine directly rather than on the VHF. Decision made; furl the mainsail, tack the Genoa, and do a 180-degree turn! It’s always such a drastic change to head downwind after beating to windward. 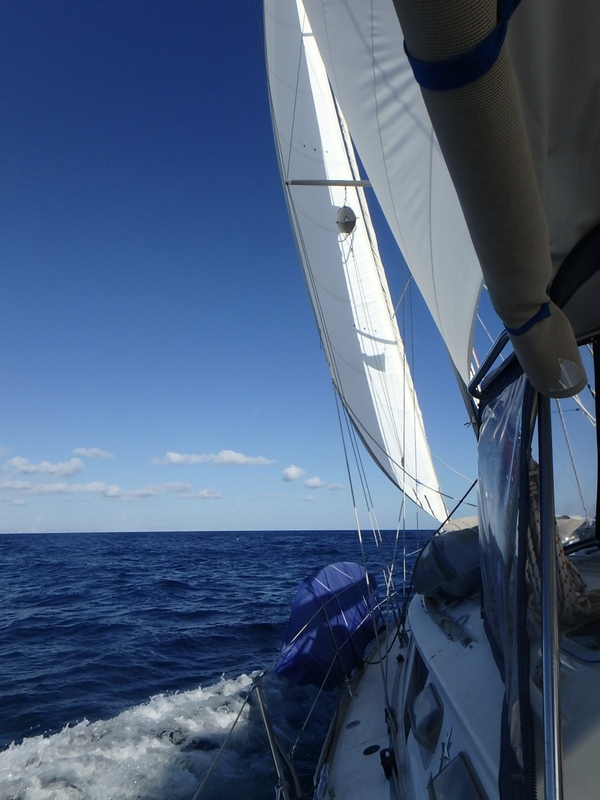 The boat starts surfing over the waves, and traveling with the wind feels calm even when it’s blowing 15-18, and you’re still moving along at 6+ knots under just the Genoa! We set a course for the channel marker at the entrance of the bay that is used by cruise ships, ferries, and tankers making a sharp turn into the larger section of the bay. Hopefully we wouldn’t meet one as we made the turn! Before reaching the channel marker we tried the engine again, but no luck. Time to get ready for another anchor under sail. Expecting to have to tack our way into the bay we rolled out the smaller staysail and furled the big Genoa. Having two sails is great, except that to tack our Genoa requires that we furl it, and then unfurl it on the new tack, in order to get it through the narrow gap between the two fore stays. So, we were now sailing under staysail alone, trying to keep our heading as close to the wind and the back of the bay as possible. After passing the point, the wind started getting very fluky, changing strength and direction by as much as 60 degrees. We kept adjusting the sail, tacked a few times, trying all the while to keep our speed and not lose steerage. At one point we were about to tack and suddenly the wind veered off to leeward; we had to change course so much that we were just about pointed toward the entrance. I thought we’d have to do a 360 to get back on course, but luckily along came a strong gust that slowly gave us steerage again, and allowed us to tack one last time. Then the wind was pretty much on our nose no matter what we did and our headway was severely limited, so in 25′ of water we dropped anchor and rolled up the sail. The wind was still strong enough to push us down on the anchor and we were soon set, safe and sound in Bahia Falsa. So now we wait. It’s the weekend and we will have to wait until Monday to reach anyone at Cross Marine. Thankfully we’re in a safe anchorage, we have all we need, and we can dinghy to shore to pick up Rob when he’s available. And the best part is that we have seals and two huge resident turtles swimming around the boat! OH, and sunsets….did I mention awesome sunsets?? Ah, life is good! You make a very difficult and dangerous situation seem like a cake walk. Which it wasn’t. Obviously experience counts for a lot in what could have been a nasty event. Hopefully all turns out well!